One angler that I have the highest respect for is Fred Wilton. Many anglers today won’t have heard of Fred, but in fact Fred Wilton single-handedly initiated a bait revolution back in the 70s that led to the boilies we fish with today. Fred believed that carp, like any wild creature, given the choice over time, would show a distinct preference for a food source that offered it the perfect balanced diet fulfilling all or most of it’s nutritional needs. Given the choice of a food source that is nutritionally nearly perfect against various much less nutritional food sources, the carp would show more and more preference for the nutritionally perfect food source, if it was applied to a lake consistently over a period of time. Flavours were only added to the baits as a ‘label’ and not as the primary attraction source. The base mix is what the fish wanted and the flavour simply allowed the carp to identify the food source and differentiate it from other food items. The term HNV or ‘High Nutritional Value’ bait started to be whispered around the very small carp fishing grapevine of the time. There are many examples of this concept throughout nature, where wild animals change their natural diet in preference of an easier to obtain, highly nutritional food source. In the late 70s and early 80s more and more carp anglers were trying to understand carp nutrition and formulate baits that got closer and closer to the ultimate nutritional food source. These baits, combined with the hair rig that came along around during the same period, totally an utterly changed carp fishing forever. The first anglers to understand and apply HNV baits to their waters started to completely out-fish everyone else. The results were amazing. I can remember this being a very exciting time to be carp fishing and I started playing with many ingredients to try to make the ultimate paste bait and later on the ultimate boilie. No commercially available boilies were available at the time, so everything had to be sourced and recipes invented and fine tuned over time. All boilies were hand rolled which took many hours. 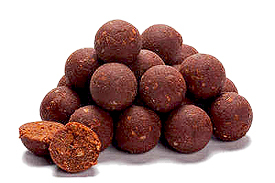 Over the next years, boilies completely took over carp fishing and started to become commercially available. Profit then often took over as the priority compared to having the best possible food source baits which became more and more expensive. Today, few people talk about HNV baits and people just talk about flavours and sniff the bag of bait to see what it smells like. Few people know what is in the base mixes. Often poor nutritional value baits are used to today to carry flavourings added that will certainly attract and catch carp, but not anywhere near as effectively as true HNV food source baits. True HNV baits get better and better as more are applied to a lake. The opposite is often true for ‘attractor baits’ that become less and less effective over time. The original concepts are almost lost to an era of carp fishing that is long gone. This has now presented a great opportunity since things have almost gone full circle. Boilies are often simply carriers made of low nutritional value base mixes that carry flavours to try to entice the carp into at least sampling them and at the same time making profit for the suppliers. Now imagine baiting a lake with the best quality HNV food source bait that is available with a unique flavour label using hundreds of kilos over many months. The results can be totally spectacular. These types of HNV baits, once established, can almost totally dominate a lake for a long period of time with multiple captures of the same fish often occurring. These baits have certainly served me well over the last 30 or more years of carp fishing. They also do the carp a huge amount of good. You end up with healthy fish, strong immune systems, minimal water quality problems from uneaten baits and waste and healthy year-on-year weight gains. It’s win-win-win for the angler, the carp and the fishery. Here at Lac Serreire, we worked on achieving the best possible HNV fishmeal boilie that we could without profit being our driver. We simply wanted a bait that provided the best possible food source for the fish that would get better and better over time, allowing anglers to have total confidence in it and to encourage super healthy and very big carp. We have just about achieved this situation, especially in Badgers Holt where the effects can bee seen more quickly since it is the smaller of our two lakes. We have applied our Crayfish & Squid fishmeal HNV bait in very high quantities and the results have been amazing. On some occasions one rod fished on this bait has out fished five rods fished on other baits. The bait is usually eaten readily by the carp and in preference to baits that they haven’t seen before. It is a real edge. Weight gains have also been superb with many new 40s and 50s on the complex this year. Thank you Fred Wilton! Your bait concepts are as valid today as they were 40 years ago!